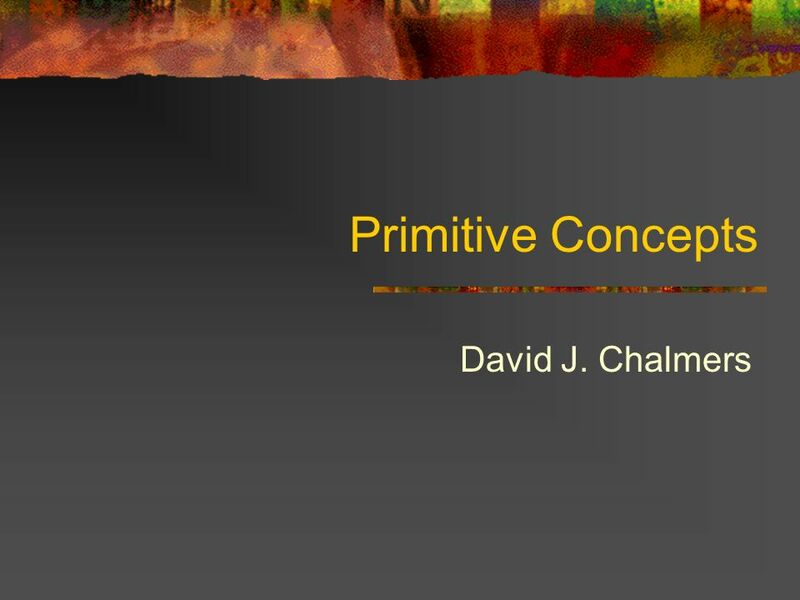 Primitive Concepts David J. Chalmers. 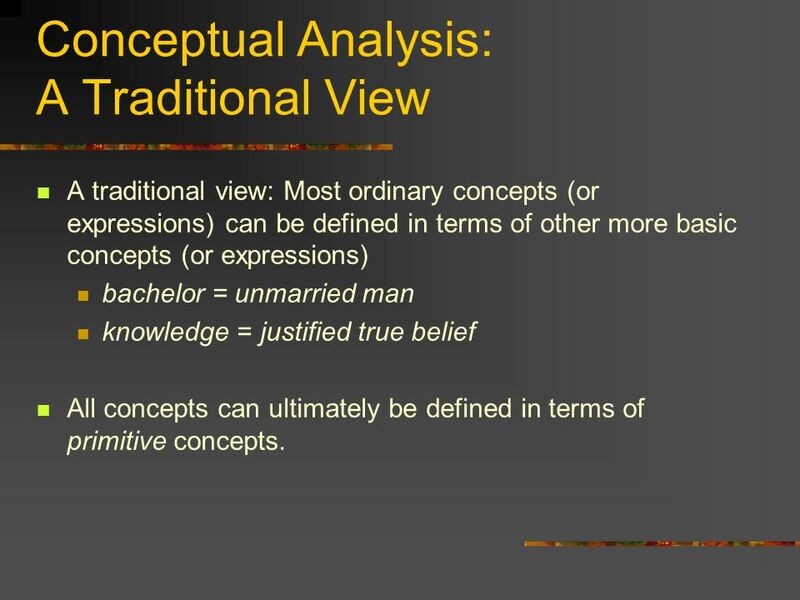 A traditional view: Most ordinary concepts (or expressions) can be defined in terms of other more basic concepts (or expressions) bachelor = unmarried man knowledge = justified true belief All concepts can ultimately be defined in terms of primitive concepts. Even if we can’t define knowledge in more basic terms, we can still apply it to scenarios characterized in more basic terms E.g. Gettier literature: Given scenarios characterized in non-’knowledge’-involving terms, people have conceptual intuitions about whether the scenario is a case of knowing that P Cf. 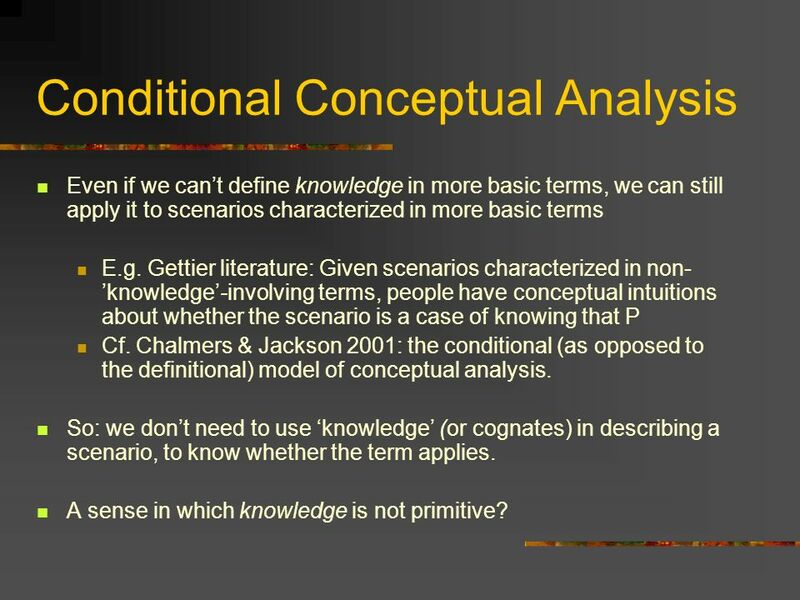 Chalmers & Jackson 2001: the conditional (as opposed to the definitional) model of conceptual analysis. 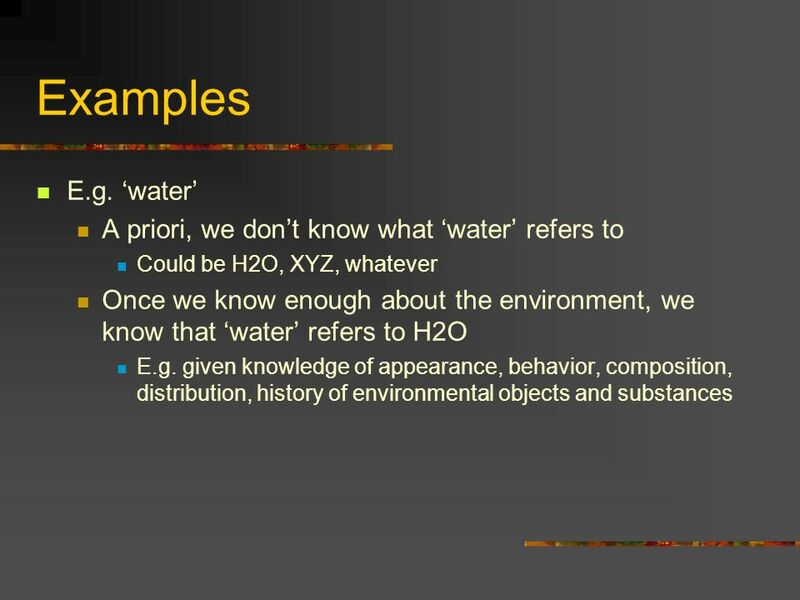 So: we don’t need to use ‘knowledge’ (or cognates) in describing a scenario, to know whether the term applies. A sense in which knowledge is not primitive? Many/most concepts are like knowledge here, but not all. E.g. time (and temporal concepts)? 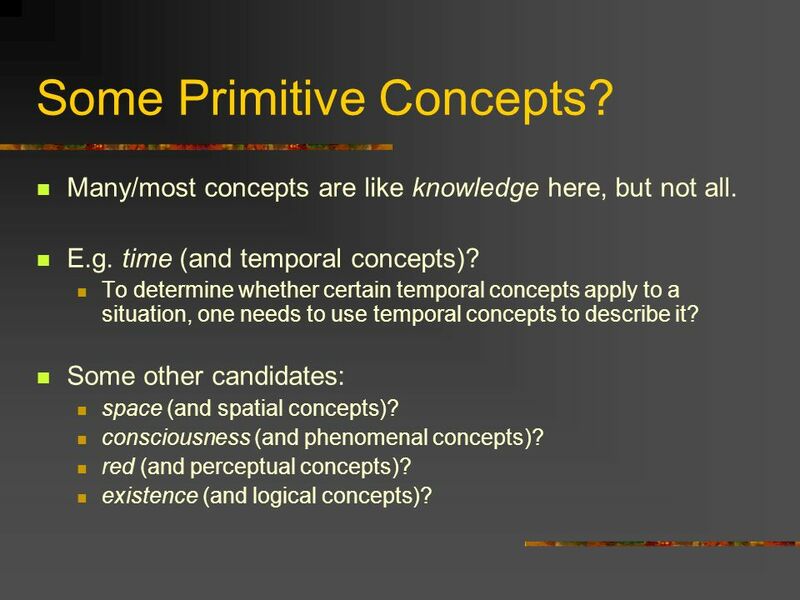 To determine whether certain temporal concepts apply to a situation, one needs to use temporal concepts to describe it? Some other candidates: space (and spatial concepts)? consciousness (and phenomenal concepts)? 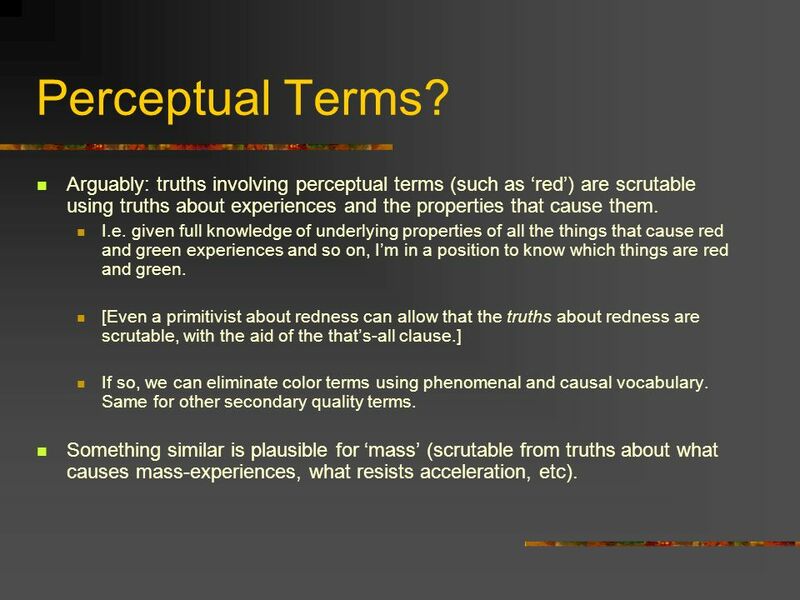 red (and perceptual concepts)? existence (and logical concepts)? N.B. 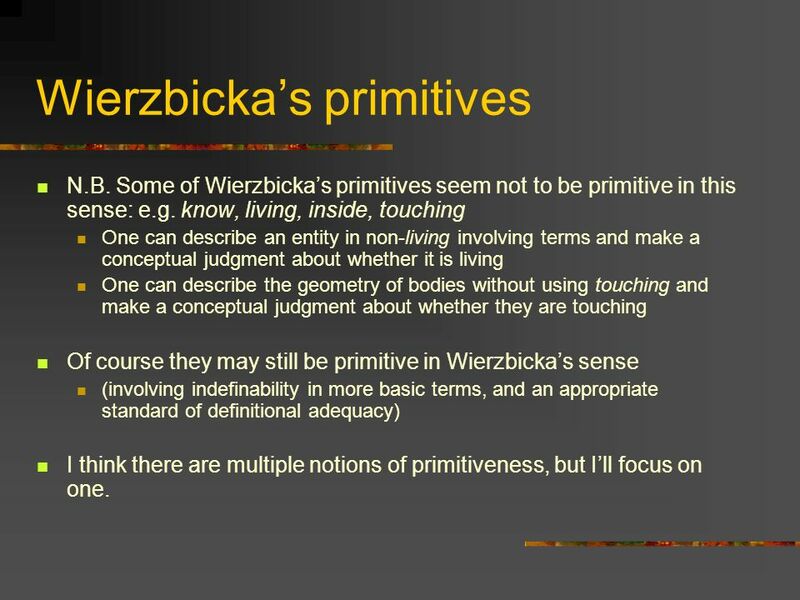 Some of Wierzbicka’s primitives seem not to be primitive in this sense: e.g. know, living, inside, touching One can describe an entity in non-living involving terms and make a conceptual judgment about whether it is living One can describe the geometry of bodies without using touching and make a conceptual judgment about whether they are touching Of course they may still be primitive in Wierzbicka’s sense (involving indefinability in more basic terms, and an appropriate standard of definitional adequacy) I think there are multiple notions of primitiveness, but I’ll focus on one. 9 Project (1) Make somewhat more precise sense of this notion of a primitive concept. 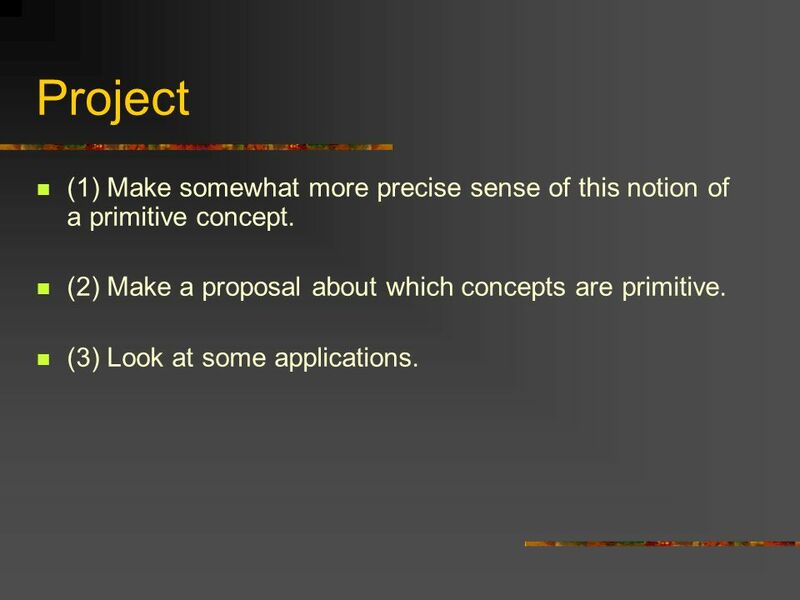 (2) Make a proposal about which concepts are primitive. (3) Look at some applications. 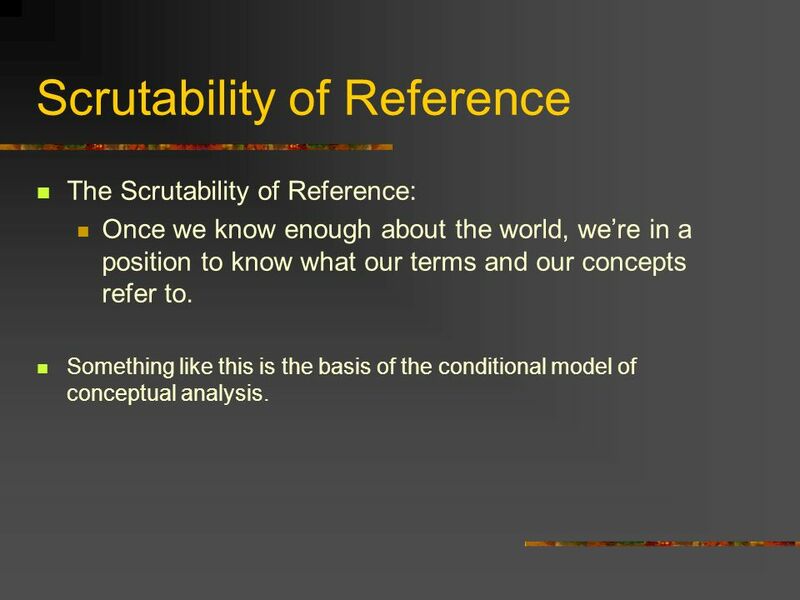 The Scrutability of Reference: Once we know enough about the world, we’re in a position to know what our terms and our concepts refer to. Something like this is the basis of the conditional model of conceptual analysis. 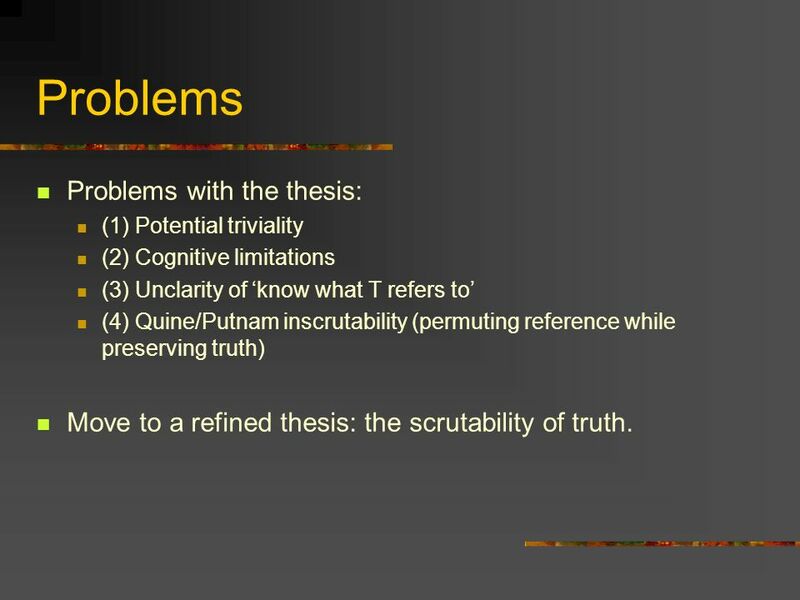 (1) Potential triviality (2) Cognitive limitations (3) Unclarity of ‘know what T refers to’ (4) Quine/Putnam inscrutability (permuting reference while preserving truth) Move to a refined thesis: the scrutability of truth. 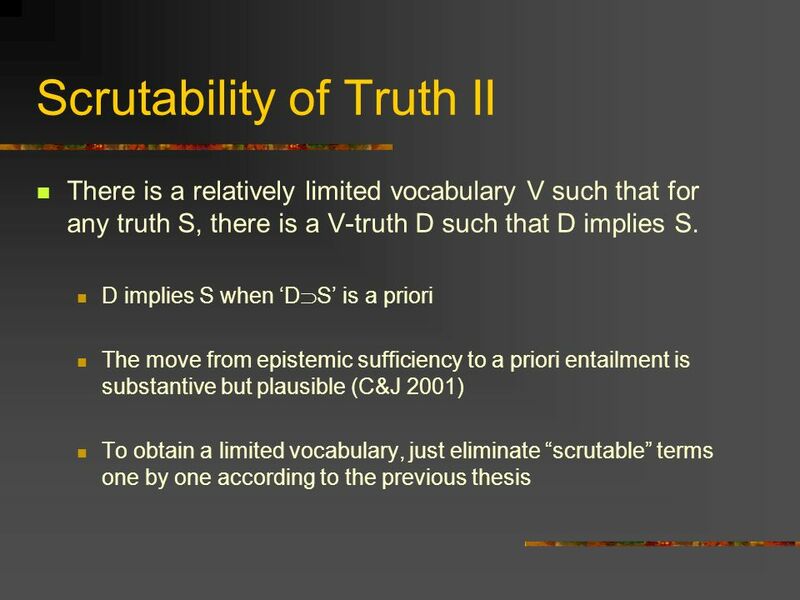 13 Scrutability of Truth For most terms T used by a speaker, then for any truth S involving T, there exists a truth D such that D is independent of T and D is epistemically sufficient for T D is independent of T when D doesn’t contain T or any close cognates. 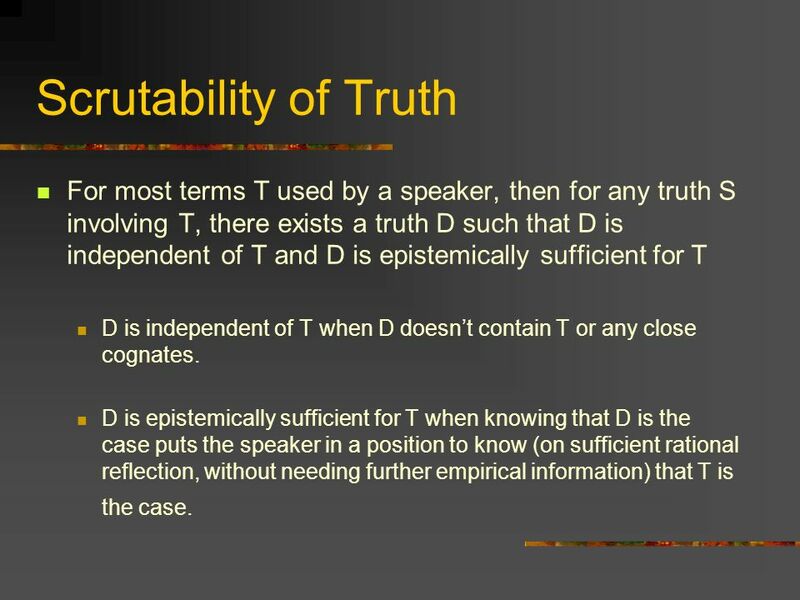 D is epistemically sufficient for T when knowing that D is the case puts the speaker in a position to know (on sufficient rational reflection, without needing further empirical information) that T is the case. 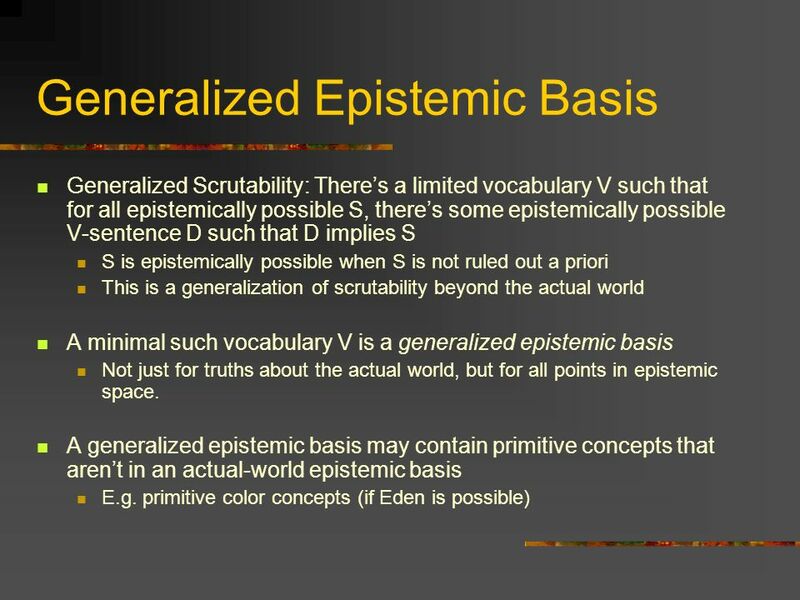 15 Epistemic Basis A minimal such vocabulary V can be seen as an epistemic basis for actual truths. Suggestion: The members of an epistemic basis correspond to primitive concepts (or concept-families). 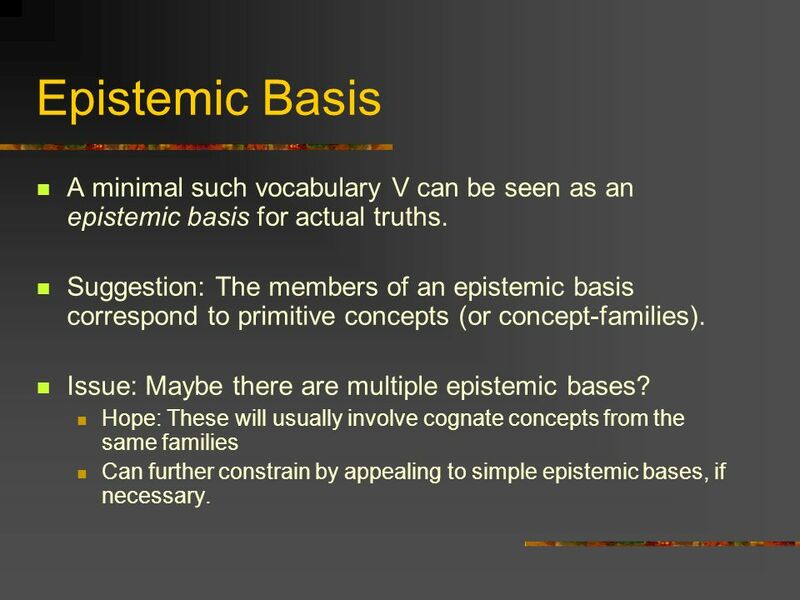 Issue: Maybe there are multiple epistemic bases? Hope: These will usually involve cognate concepts from the same families Can further constrain by appealing to simple epistemic bases, if necessary. 16 What is in an Epistemic Basis? 17 PQTI as Epistemic Basis? I’ll assume that the C&J 2001 thesis is correct. First pass suggestion: the expressions used in PQTI form an epistemic basis? But: it’s implausible that microphysical concepts are primitive. Microphysical terms are scrutable using e.g. causal-role characterizations. 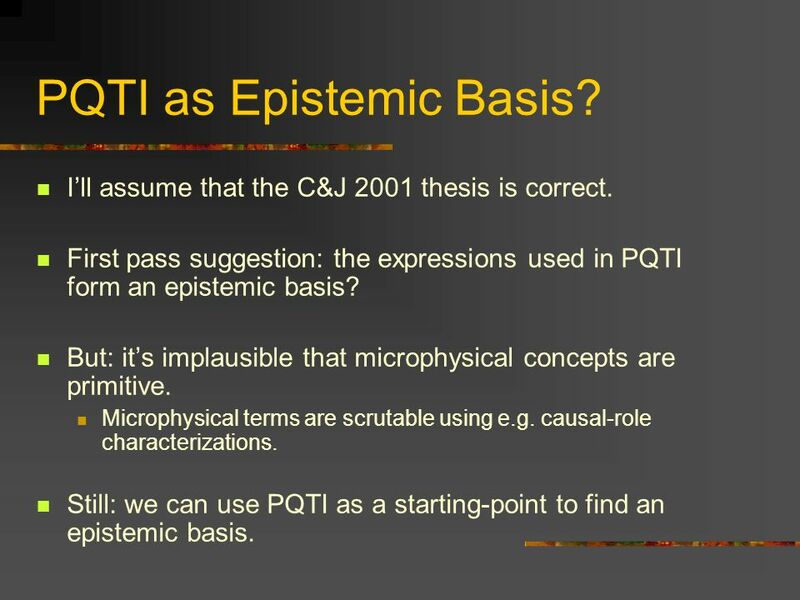 Still: we can use PQTI as a starting-point to find an epistemic basis. 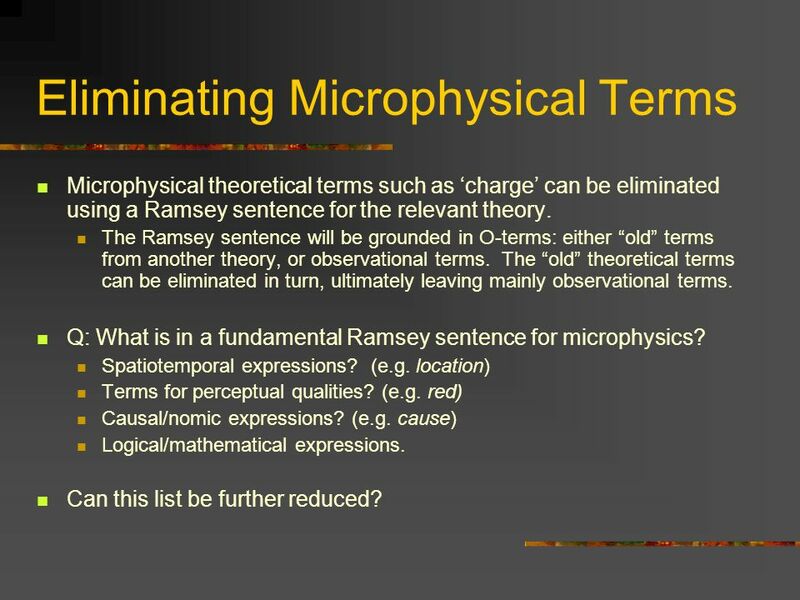 Microphysical theoretical terms such as ‘charge’ can be eliminated using a Ramsey sentence for the relevant theory. The Ramsey sentence will be grounded in O-terms: either “old” terms from another theory, or observational terms. The “old” theoretical terms can be eliminated in turn, ultimately leaving mainly observational terms. Q: What is in a fundamental Ramsey sentence for microphysics? Spatiotemporal expressions? (e.g. location) Terms for perceptual qualities? (e.g. red) Causal/nomic expressions? (e.g. cause) Logical/mathematical expressions. Can this list be further reduced? 19 Perceptual Terms? 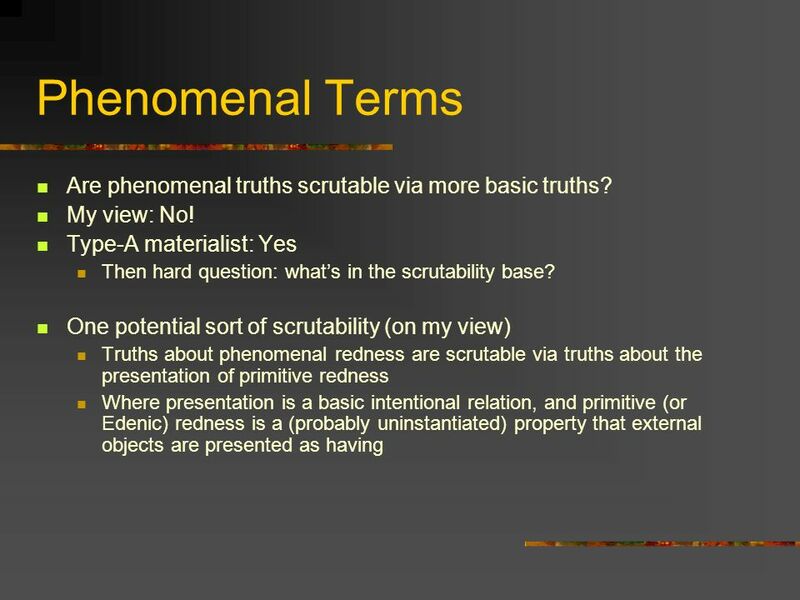 Arguably: truths involving perceptual terms (such as ‘red’) are scrutable using truths about experiences and the properties that cause them. I.e. given full knowledge of underlying properties of all the things that cause red and green experiences and so on, I’m in a position to know which things are red and green. [Even a primitivist about redness can allow that the truths about redness are scrutable, with the aid of the that’s-all clause.] If so, we can eliminate color terms using phenomenal and causal vocabulary. Same for other secondary quality terms. Something similar is plausible for ‘mass’ (scrutable from truths about what causes mass-experiences, what resists acceleration, etc). 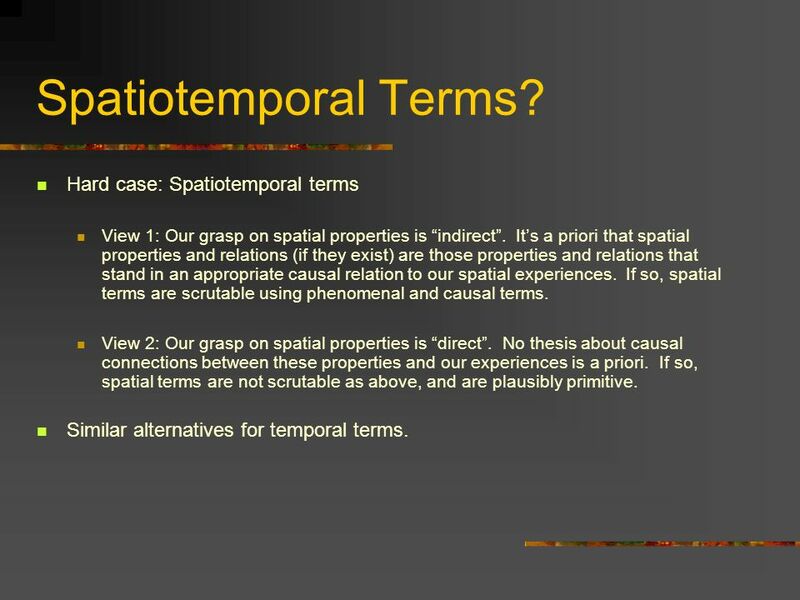 View 1: Our grasp on spatial properties is “indirect”. It’s a priori that spatial properties and relations (if they exist) are those properties and relations that stand in an appropriate causal relation to our spatial experiences. If so, spatial terms are scrutable using phenomenal and causal terms. View 2: Our grasp on spatial properties is “direct”. No thesis about causal connections between these properties and our experiences is a priori. If so, spatial terms are not scrutable as above, and are plausibly primitive. Similar alternatives for temporal terms. I endorse view 1. 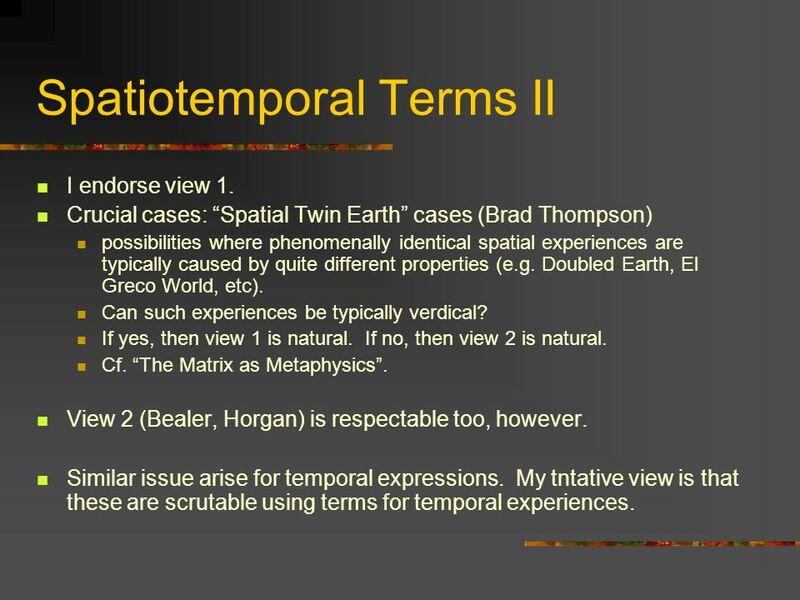 Crucial cases: “Spatial Twin Earth” cases (Brad Thompson) possibilities where phenomenally identical spatial experiences are typically caused by quite different properties (e.g. Doubled Earth, El Greco World, etc). Can such experiences be typically verdical? If yes, then view 1 is natural. If no, then view 2 is natural. Cf. “The Matrix as Metaphysics”. View 2 (Bealer, Horgan) is respectable too, however. Similar issue arise for temporal expressions. My tntative view is that these are scrutable using terms for temporal experiences. 22 Causal Terms What about causal terms? Maybe causal truths are scrutable from underlying truths about counterfactual dependence? And maybe these are scrutable from underlying truths about laws, I.e. involving natural necessity? 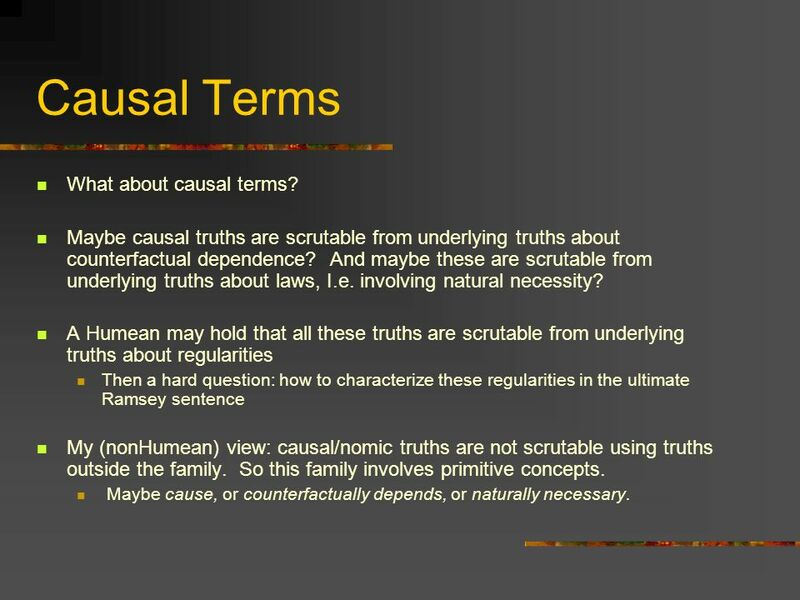 A Humean may hold that all these truths are scrutable from underlying truths about regularities Then a hard question: how to characterize these regularities in the ultimate Ramsey sentence My (nonHumean) view: causal/nomic truths are not scrutable using truths outside the family. So this family involves primitive concepts. Maybe cause, or counterfactually depends, or naturally necessary. Are logical terms eliminable? Plausibly no: one needs conjunction (definitely), negation (probably), and existential quantification (arguably) in any scrutability base. [or cognates: Scheffer stroke, universal quantifier] Are mathematical terms eliminable? 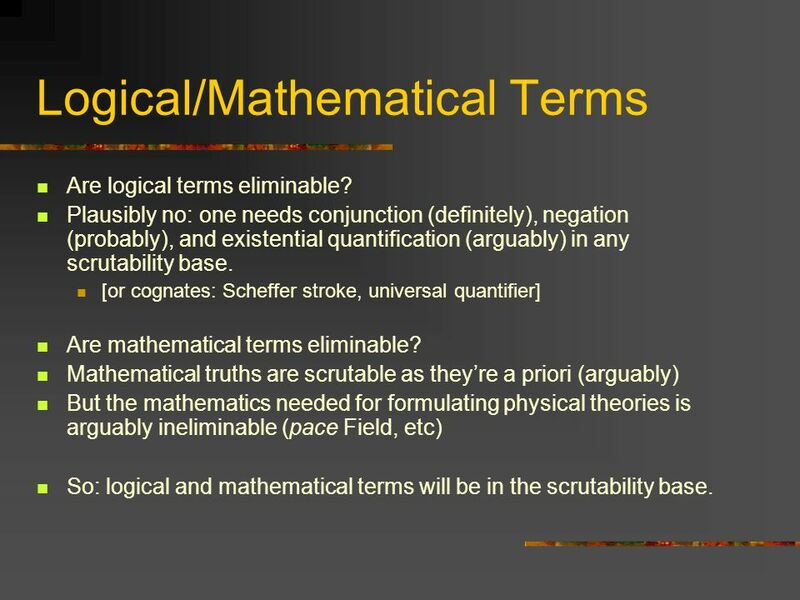 Mathematical truths are scrutable as they’re a priori (arguably) But the mathematics needed for formulating physical theories is arguably ineliminable (pace Field, etc) So: logical and mathematical terms will be in the scrutability base. 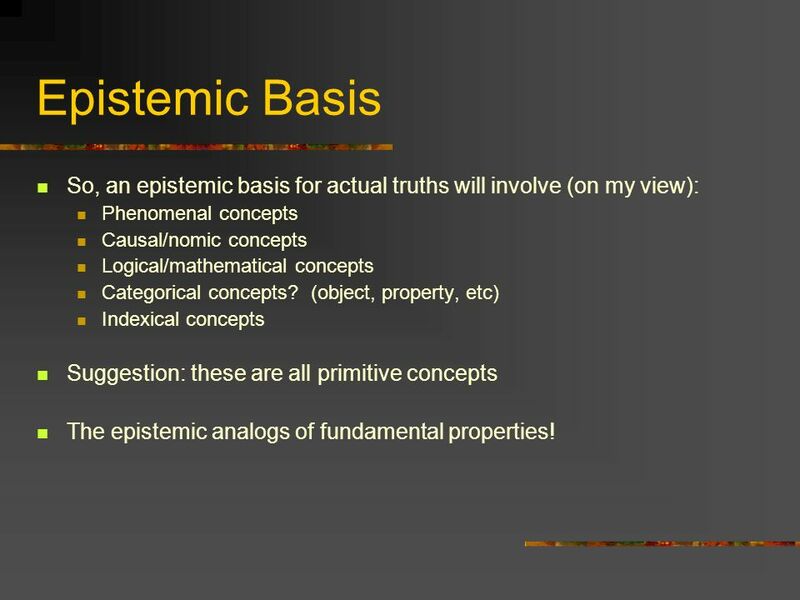 25 Epistemic Basis So, an epistemic basis for actual truths will involve (on my view): Phenomenal concepts Causal/nomic concepts Logical/mathematical concepts Categorical concepts? 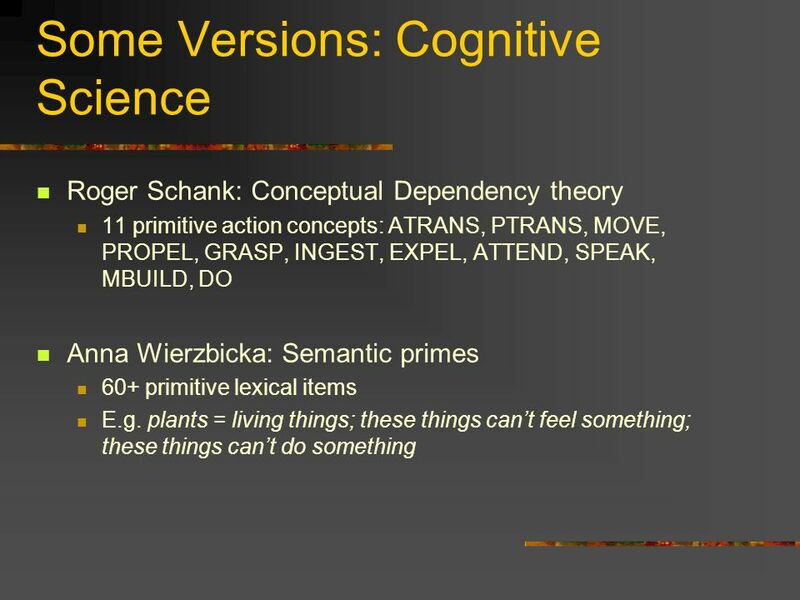 (object, property, etc) Indexical concepts Suggestion: these are all primitive concepts The epistemic analogs of fundamental properties! 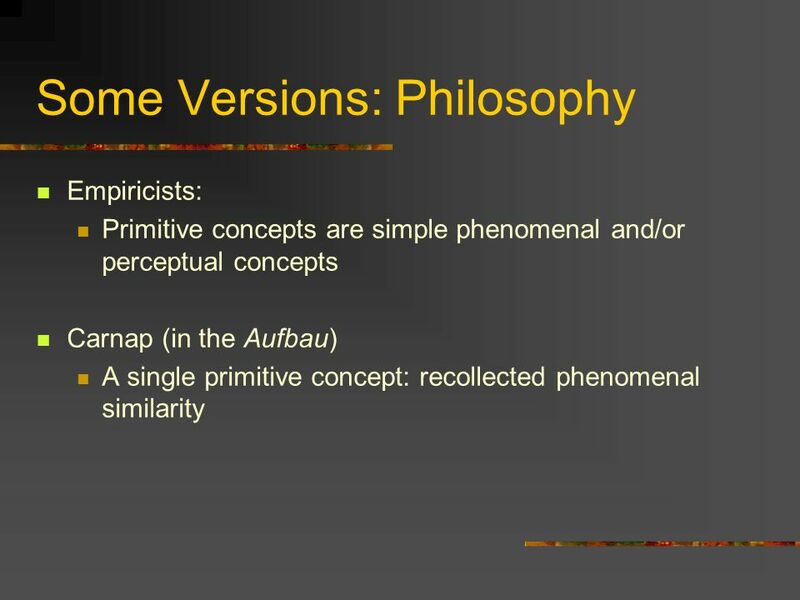 Are there other primitive concepts? (1) Concepts responsible for truths not implied by PQTI? Moral truths? Metaphysical truths? Mathematical truths? Vague truths? 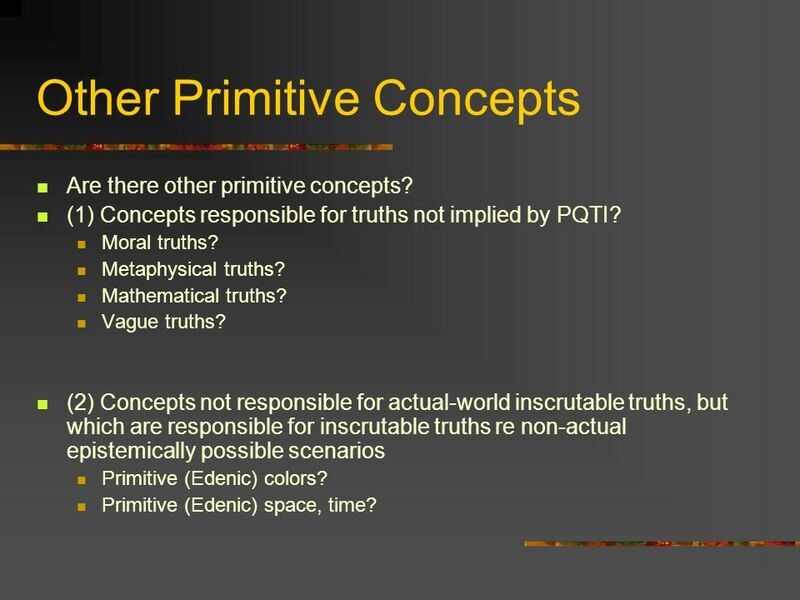 (2) Concepts not responsible for actual-world inscrutable truths, but which are responsible for inscrutable truths re non-actual epistemically possible scenarios Primitive (Edenic) colors? Primitive (Edenic) space, time? 28 Beyond Apriority? 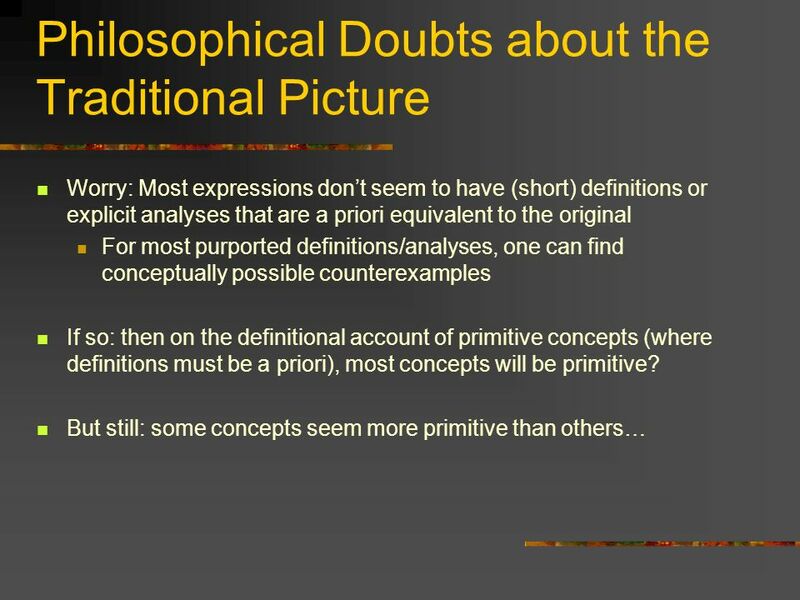 Worry: maybe there are primitive concepts (in some sense) that are such that all epistemically possible sentences involving them are scrutable via other vocabulary Maybe because the concepts are incoherent, and mostly generate a priori falsehoods Edenic pain? Moral concepts, on some views? Primitive choice? Maybe because the concepts mostly generate a priori truths Mathematical concepts (via role in mathematical truths)? 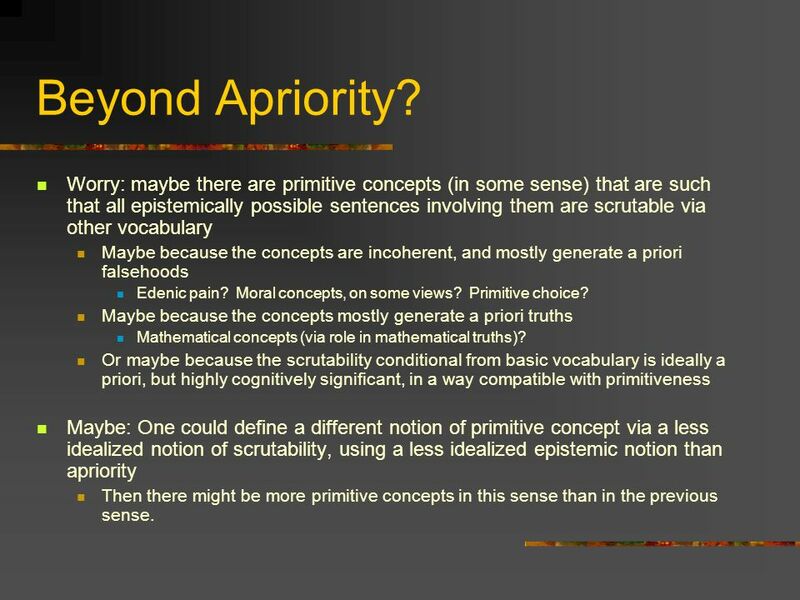 Or maybe because the scrutability conditional from basic vocabulary is ideally a priori, but highly cognitively significant, in a way compatible with primitiveness Maybe: One could define a different notion of primitive concept via a less idealized notion of scrutability, using a less idealized epistemic notion than apriority Then there might be more primitive concepts in this sense than in the previous sense. 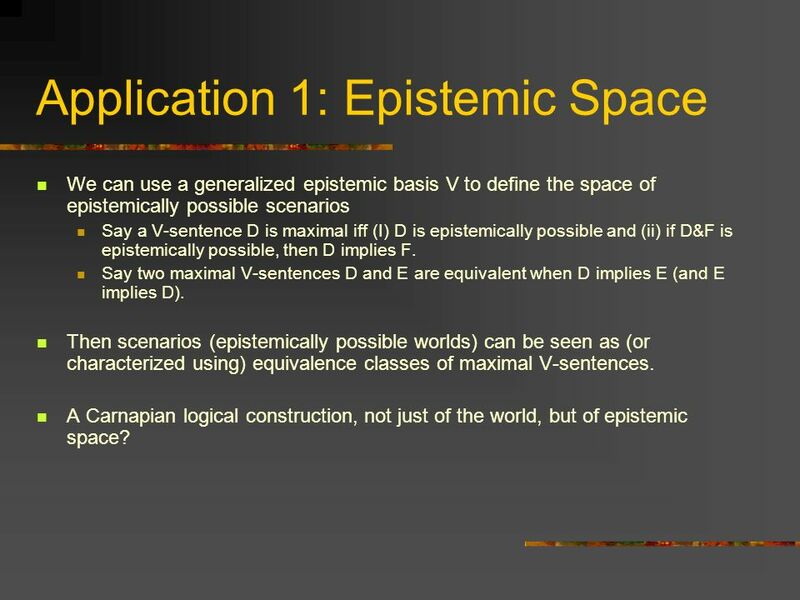 We can use a generalized epistemic basis V to define the space of epistemically possible scenarios Say a V-sentence D is maximal iff (I) D is epistemically possible and (ii) if D&F is epistemically possible, then D implies F. Say two maximal V-sentences D and E are equivalent when D implies E (and E implies D). Then scenarios (epistemically possible worlds) can be seen as (or characterized using) equivalence classes of maximal V-sentences. A Carnapian logical construction, not just of the world, but of epistemic space? The primary intension of a sentence S is true at a scenario W when D implies S, where D is a canonical description of W A canonical description can be: a maximal description in terms of an epistemic basis V. This applies whether scenarios are maximal epistemic possibilities (last slide) or centered worlds The application to centered worlds requires that all non-indexical primitive concepts are semantically neutral N.B. 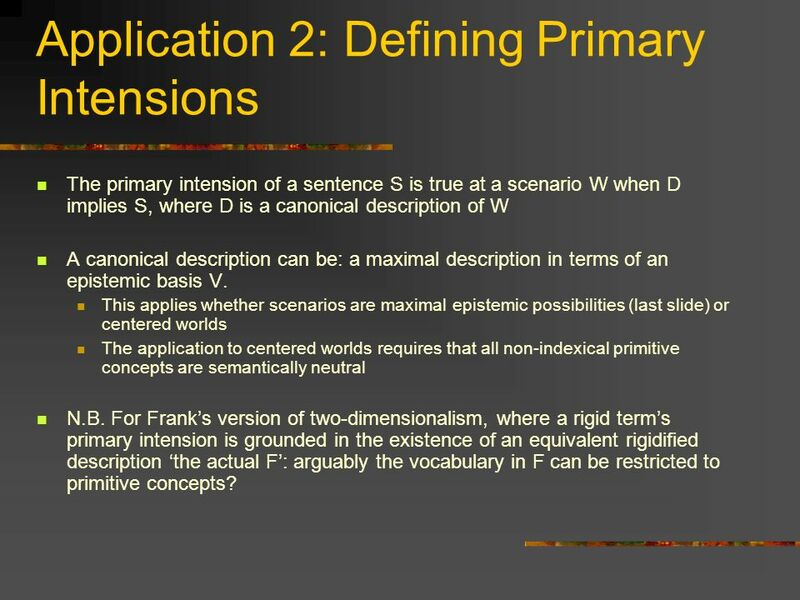 For Frank’s version of two-dimensionalism, where a rigid term’s primary intension is grounded in the existence of an equivalent rigidified description ‘the actual F’: arguably the vocabulary in F can be restricted to primitive concepts? 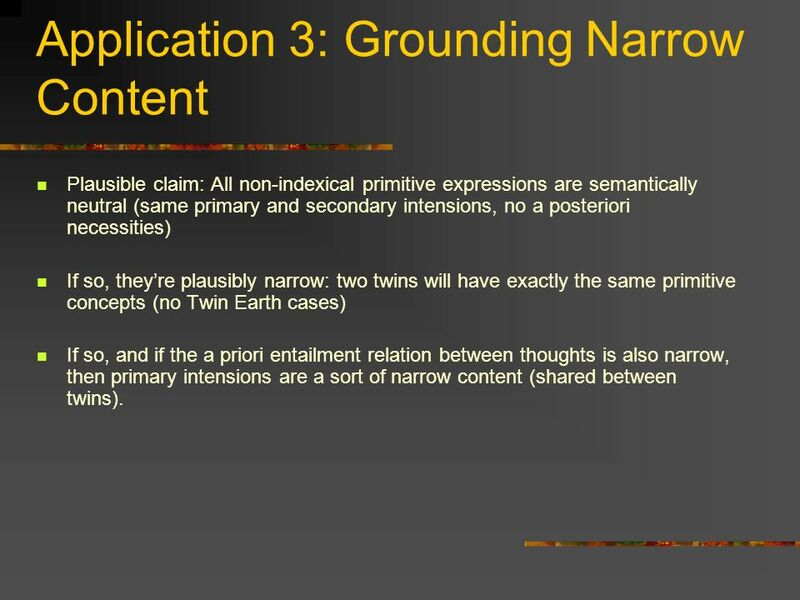 Plausible claim: All non-indexical primitive expressions are semantically neutral (same primary and secondary intensions, no a posteriori necessities) If so, they’re plausibly narrow: two twins will have exactly the same primitive concepts (no Twin Earth cases) If so, and if the a priori entailment relation between thoughts is also narrow, then primary intensions are a sort of narrow content (shared between twins). 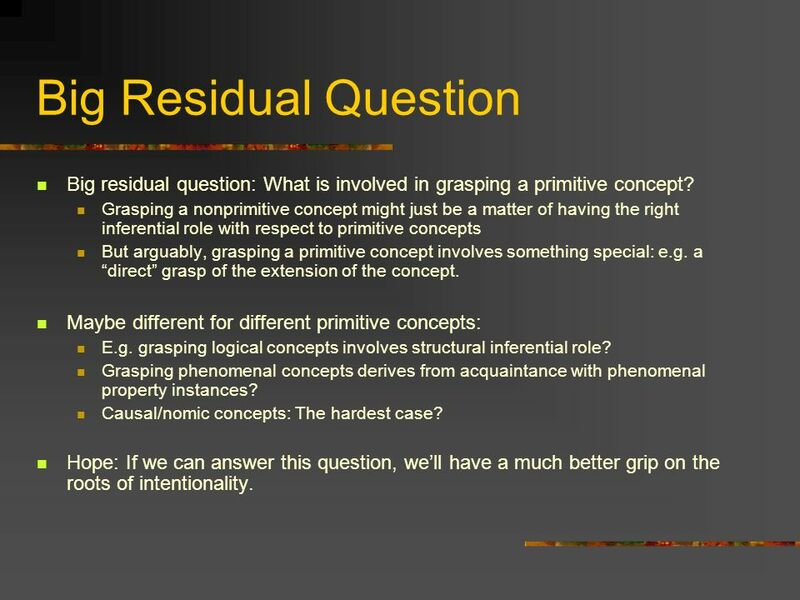 34 Big Residual Question Big residual question: What is involved in grasping a primitive concept? Grasping a nonprimitive concept might just be a matter of having the right inferential role with respect to primitive concepts But arguably, grasping a primitive concept involves something special: e.g. a “direct” grasp of the extension of the concept. Maybe different for different primitive concepts: E.g. grasping logical concepts involves structural inferential role? Grasping phenomenal concepts derives from acquaintance with phenomenal property instances? Causal/nomic concepts: The hardest case? Hope: If we can answer this question, we’ll have a much better grip on the roots of intentionality. 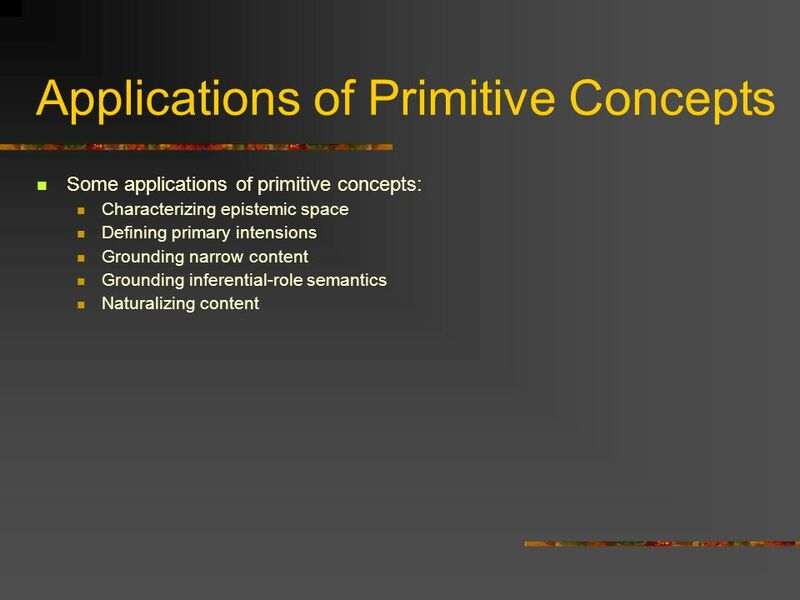 Download ppt "Primitive Concepts David J. Chalmers." Commentary on Katalin Balog, In defense of the phenomenal concept strategy Assistant Prof. István Aranyosi, Bilkent University, Ankara, Turkey. R & R David Chalmers. Triangle object content phenomenology. Constructing the World Week 2 David Chalmers. Carnaps Aufbau (1) Carnaps purposes in the Aufbau (2) Carnaps primitives (3) Carnaps derivation relation. X-Phi Meets A-Phi David Chalmers. Moral Relativism and Conceptual Analysis David J. Chalmers. Constructing the World Week 4 David Chalmers. The Case for Scrutability (1) PQTI and the Cosmoscope (2) The Cosmoscope Argument (3) Empirical Scrutability. Constructing the World Week 3 David Chalmers. Varieties of Scrutability (1) Sentences, Propositions, Thoughts (2) Empirical, Conditional, A Priori, Generalized. Joe Levines Purple Haze. 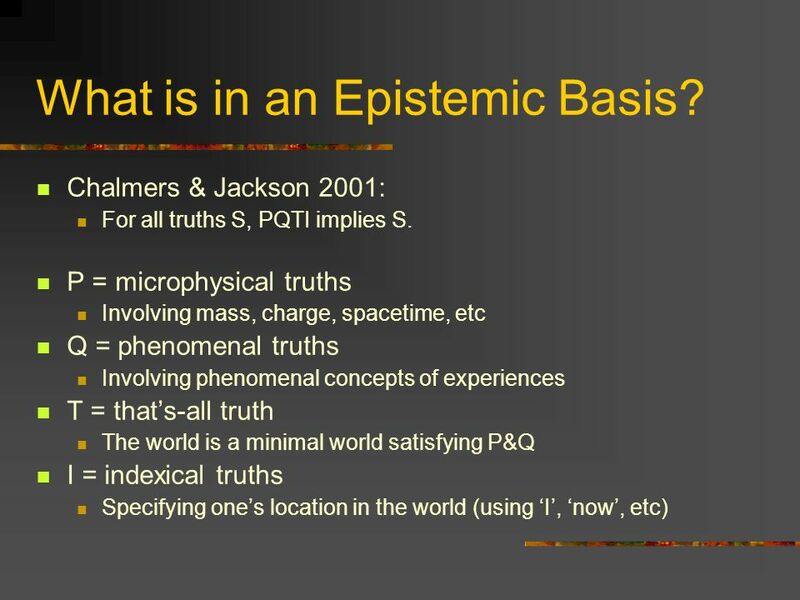 Physical/Phenomenal Gaps P = the complete microphysical truth Q = a phenomenal truth Q1: Is there an epistemic gap between. Varieties of Representationalism David J. Chalmers. Revelation, Humility, and the Structure of the World David J. Chalmers. Introspection and Consciousness: Wrap-Up Talk David Chalmers. What Is the Unity of Consciousness? Tim Bayne & David Chalmers.